Councils have an obligation to tidy up litter from public spaces. If you know of an accumulation of litter, fly tipping or graffiti within Dudley MBC please click the link below and complete the form. The council’s team will usually respond pretty quickly and effectively. 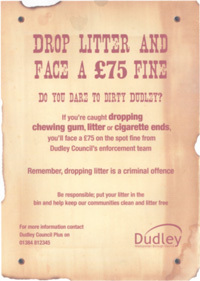 Click here for the Dudley MBC form to report litter. This will open a new window to the Dudley MBC website. Follow the simple process through as it only takes a couple of minutes. The council officers will review your request and usually provide feedback once the work is completed. Click here to report flytipping and litter to South Staffs.